Vin Downes was so taken by the music of finger pickers like Will Ackerman from the Windham Hill label after listening to a sampler; he took his electric guitar and put it away. He never looked back and has been playing an acoustic ever since. With Unlike The Stars, his third release, Downes gives you a reason to believe that he did indeed made the right decision stowing away that six string electric. The acoustic guitar can have just as much impact and power as any electric if it’s played properly. I would have to say with conviction that Mr. Downes knows his instrument quite well. All of the tracks presented on this album convey warm tones and atmospheres that relax and put you into a state of simple gratefulness for life itself. The title track is one of the highlights along with “Departure.” The title “Departure” is quite apt as it will force you to literally depart from whatever it is you are doing or focusing on. If you happen to be stressing out about something in particular, that feeling will melt like snow in the spring. Good music creates an ongoing movie in your mind’s eye. I had visions of a warm summer breeze touching my face and I heard a babbling brook, which in turn gave me a slice of serenity rarely felt (except when I am asleep!). All of this beauty was brought forth by this man’s music. The delicate yet impressionable sounds emanating from his guitar will lead you down a path of enlightenment, and I do believe that is the purpose of this music. If that is a fact then this album gets the job done. Some of the tracks are accentuated by some cello, which promotes a sense of sadness and longing at times depending on the overall makeup of the track. But in this case, because of Downes’ guitar placed just were it needs to be, those feelings never surface, he keeps everything light and airy. 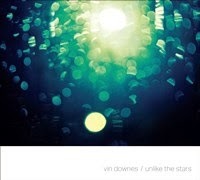 Perhaps the track “Window Looking…” closing the curtain on this recording, really is a hint that the music of Vin Downes is a doorway to his soul and more importantly, you the listener. Give it a try, sit back and relax and let everything empty out of that busy mind and let Unlike The Stars show you the way. THE FINAL ON VINYL REVIEWS ARE HERE!